People often use the terms “coaching” and “mentoring” interchangeably. However, they represent two separate and distinct types of functions and relationships. They do share some basic principles such as developing, supporting, and encouraging others. They also both involve the use of the same skills of questioning, listening, clarifying, and reframing. However, the way they interact, the roles, and the overall focus is significantly different. Coaching is a more formal structured relationship centered on improving an individual’s performance and focuses on specific skills and goals. Mentoring is a more informal relationship centered on an association in which a more experienced individual uses his or her knowledge to guide the development of an inexperienced individual. Mentoring focuses on the individual and his or her overall career and/or personal development. 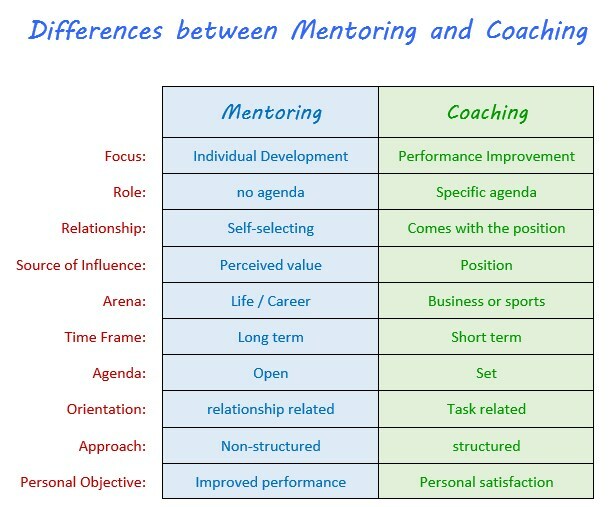 The following are key difference between coaching and mentoring. Mentoring is focused on the person’s overall growth and development. Its purpose is to develop an individual not only for his or her current role, but also for the future. Coaching, on the other hand, is focused on improvements in behavior and performance to resolve present issues. The purpose of coaching is to improve the individual’s performance for a specific current task. It involves either enhancing current skills or acquiring new skills. Coaching occurs in a performance based arena such as a sport or business. Mentoring deals with broader life and career issues. Therefore, mentoring can occur in various areas of life. It may be with at-risk youth, in schools, or with business organizations. Mentors are facilitators and teachers allowing the mentee to discover his or her own direction. The emphasis is on active listening, providing information, making suggestions, and establishing connections. A coach’s role is to improve performance through the use of objectives and goals. The emphasis is on instruction, assessment, and monitoring. Coaching is task oriented. Coaches focus on improvement of knowledge, skills, or abilities to better perform a given task. This requires the coach to be a content expert who is capable of teaching the individual how to develop these skills. Mentoring is relationship oriented. Both parties mutually share ideas and thoughts about different issues that affect his or her professional and personal success. Mentoring is a two-way mutually beneficial relationship. Often times, a person picks his or her mentor. The mentor is usually not a direct supervisor or manager. 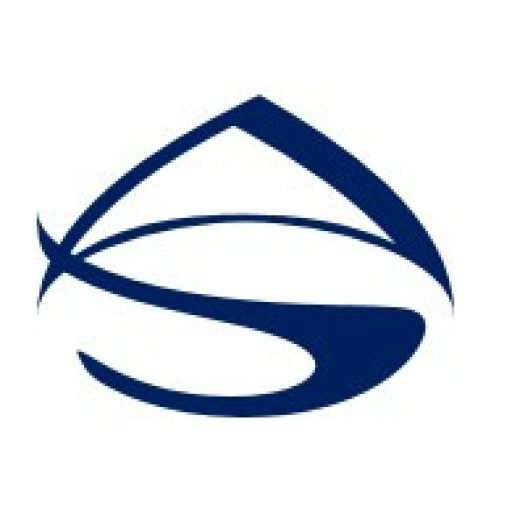 It is usually someone else within an organization that has experience and knowledge. The immediate supervisor is not directly involved with mentoring except maybe to offer suggestions on how to best use the mentoring experience or may connect a person to be a mentor. A coach is often the person’s direct report (i.e. a person for which the coach is directly responsible). It is usually his or her supervisor or manager. He or she has a direct vested interest in the person’s performance. Because of the different relationships, there is a different level of influence. The coach has direct influence since the person is often his or her direct report. A coach has an actual level of authority by nature of his or her position. A mentor’s influence, on the other hands, will be based on the perceived value of their advice and guidance. It is a power free relationship, hence, the individual does not have to follow the advice. A mentor dispenses advice which the mentee is free to pick and choose what they do. However, they usually follow because of the mutual respect and value of the mentor. The coach’s personal benefit is mainly in the form of job performance. If the person does well at the task the coach directly benefits. A mentor gets personal satisfaction from helping to develop another person. Coaching is often short-term and focused on resolving specific developmental issues. A coach can provide necessary direction and feedback in just a few sessions. Once the individual successfully acquires the skills, the coach is no longer needed. A mentor is personally involved in a person’s long-term development. Therefore, it is an ongoing relationship that can last for years. It is more long-term because takes a broader view of the individual. It is not focused on fixing a specific issue. It is also a relationship that is built on trust which takes time to develop. Mentoring is a self-directed and flexible. It is more informal and meetings can take place as and when the mentee needs some advice, guidance, or support. Coaching approach is more structured and formal. Often times, meetings are scheduled on a regular basis. Those meeting are oriented toward specific results. A coach has an agenda that is focused on achieving specific and immediate goals. He or she sets an agenda to reinforce or change skills and behaviors. The coach creates the need for discussion and is responsible for follow up and holding others accountable. Since the mentoring focus is on career and personal development, the context does not have specific performance objectives. Participants have choices on what to discuss. The agenda is often set by the mentee, with the mentor providing support and guidance to prepare them for future roles.